Yes it's true, even documents can be restored after a fire/water loss. Picking up the pieces after a fire/water loss can be overwhelming at best. Realizing that your documents have been damaged from the loss is even worse. But good news, SERVPRO of The Southtowns can restore your fire/water damaged documents. We understand that several documents, whether they are for residential or commercial use, are important to you and cannot be replaced. They may even contain sensitive information that should not, or cannot be shared. 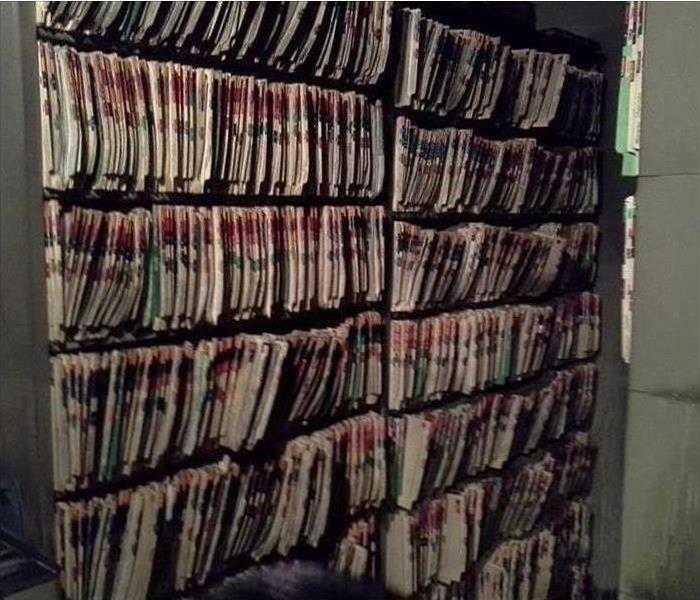 This is why our Technicians are HIPAA compliant and are trained how to deal with sensitive information. SERVPRO of The Southtowns can take fire/water damaged documents and pull the moisture and odor out using freeze-drying technology. It is important to start this process as soon as possible, so if you have documents that are affected by fire and/or water we recommend putting them in the freezer immediately and then calling our office at (716) 646-6684. This service has helped several doctor’s offices and schools that are required to keep a paper copy of documents. So if you have documents that suffered water and/or fire damage let the experts at SERVPRO of The Southtowns make it, “Like it never even happened." Congratulations Emily on your second term on the BOMA Board. As of April 10th, 2019 our very own Marketing Manager Emily McNulty was named to the 2019 Buffalo Building Owners & Managers Association Board of Directors for her second term. Emily has been active with the BOMA Association since 2014, and became a Board Member in 2015. Her favorite part of being a member of this wonderful organization, besides networking with the commercial real estate industry, is that she gets a behind the scene look at some of Buffalo’s historical properties and all the amazing renovations developers are doing to them. The Building Owners and Managers Association (BOMA) is a non-profit trade association, and a federated chapter of BOMA International. Their membership includes over 120 property professionals consisting of building owners, property managers, developers and other real estate professionals as well as associate members providing services and supplies to the commercial real estate industry. Their members own or manage over 52 million square feet of office, commercial, retail and industrial properties. For more information on BOMA check out their website at www.bomabuffalo.com. Do You Need CE Credits? We Got You Covered! Need CE Credits? Come to our class on May 7th, 2019. The significance of water damage. Causes & effects of excessive moisture on structure, contents, and health. How quickly microbial (mold) growth can appear as a result of excessive moisture. What your insured experiences with a water loss. Emergency tips that can be given by phone to keep the loss at a minimum. How fast action, in handling water loss claims, will save money & property. The procedures that mitigation companies utilize to detect, mitigate, and document water losses. The state-of-the art equipment is now used in mitigating water damage. How ground water and sewage claims are handled. Special restorative techniques for documents, electronics, and artwork. New claims handling procedures, documentation requirements, vendor relationships. Contact our office if you are interested in attending at (716) 646-6684. 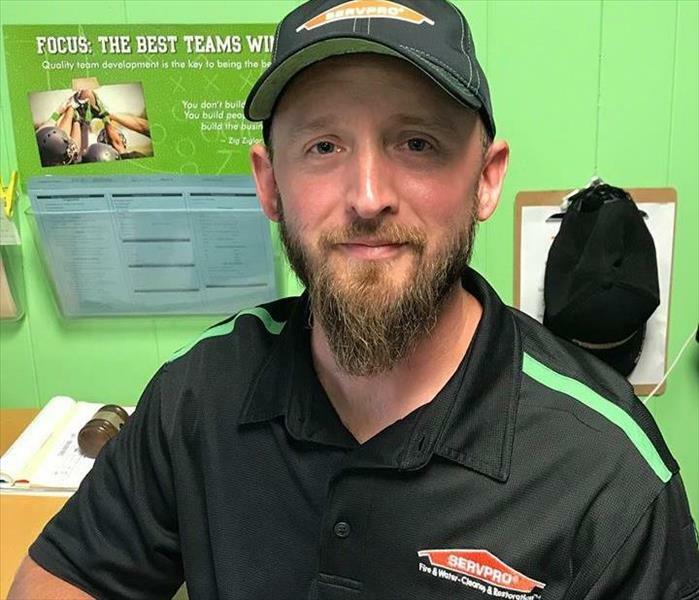 What makes your proud to work at SERVPRO of The Southtowns? The environment. We are a big “Family” company, not corporate, there is a direct line to each person in this company, an open door policy if you will. What is something that still surprises you? Never Settle. We are always striving for continuous improvements, such as the textile restoration division we just launched. Compassion. We train everyone to have a “hero” mentality. We are usually dealing with people on their worst day. Every person in the company has to have great compassion for our customers to help them though their tougher times and get them back on their feet. I try to always be here to help if I am needed, but I prefer to give initial input and then let them perform with the best information they have and the training we’ve given them. This is a tough job and things change constantly. My team has to know that I trust them to make decision because I have set the expectation and given them the training to succeed. Where do you see the company going in the next 5 – 10 years? I want to double everything – double the building space, the truck fleet and the crew numbers. We have doubled in size over the last 5 - 7 years and I am looking forward to doing it again. 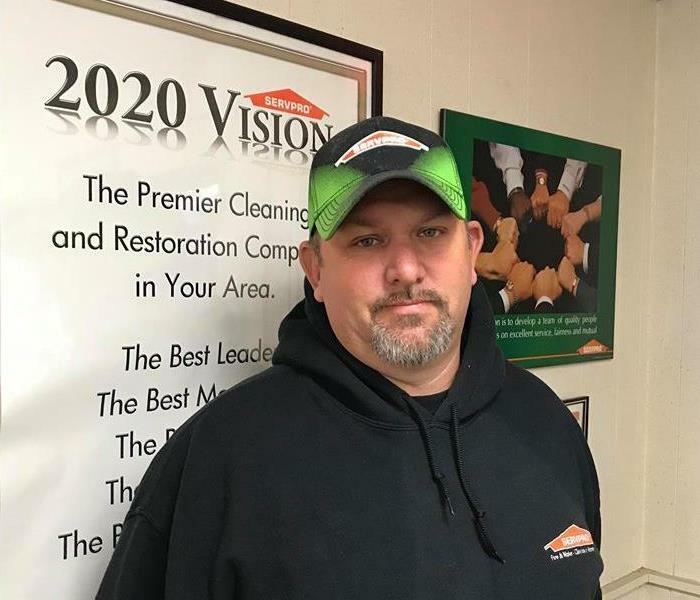 What would make someone successful at SERVPRO of The Southtowns? Initially, just someone who has a good attitude, a willingness to listen and learn. Restoration is a specialized field, I don’t expect people to come in understanding the daily activities, just that they are excited and motivated to learn and succeed. I spend most of my time communicating with adjusters on approvals for certain job criteria. Also responsible for final invoices and compliance with the programs we are on. As the industry has evolved there has been major shifts in compliance and expectations between insurance companies and vendors. It is my primary responsibility to make sure that everything we do is in line with what the insurance companies request from us. Thank you for taking the time to answer our questions Travis! You are an integral part of our team. What is one of the most interesting projects you have worked on SERVPRO of The Southtowns? We built a 2,000 square foot containment for mold remediation inside of a middle school gym. That was a really cool project to have the mitigation teams and reconstruction teams working together at the same time. What makes you proud to work at SERVPRO of The Southtowns? The sense of accomplishment when putting the finishing touches on a job. To this day, there are still jobs that blow my mind on the amount of damage caused by water and fire. Why should customers hire us? We can do it all, clean up, lineup subcontractors, rebuild. We truly handle the loss from A to Z. The front office and communication. They are involved in ALL the jobs every step of the way. Customers feel safe and confident because of all the work our front office does. Being right here where I am. Construction Manager at SERVPRO of The Southtowns, I’ll retire from here and truly love coming in every day. What is your work environment like at SERVPRO of The Southtowns? It’s a sports like atmosphere. Everybody working together to accomplish the same goal. I like to have a coach style. I set goals with my team every day and stay hands-on to teach and assist. We keep getting bigger and better! I’d like to double the construction division, maybe even my own office one day, haha! In the mornings I come in extra early, I like to get my crews prepped for the day’s schedule, set goals for what we will accomplish that day. Then I like to get out in the field and swing a hammer alongside my team. Thank you for taking the time to answer our questions Dan! You are an integral part of our team. We had to set up a very large containment center for mold remediation in a middle school gymnasium. It was like building a room inside a room. We are a family owned and operated business that is able to reach a lot of people when disaster strikes. Also, I am proud of how much we have grown since I started and all the technologic advances in the industry. The products and equipment are constantly being upgraded and improved. Our knowledge and experience. After over 20 years in this industry, there isn’t much we haven’t seen. Working my way up from carpet cleaner to a production manager. 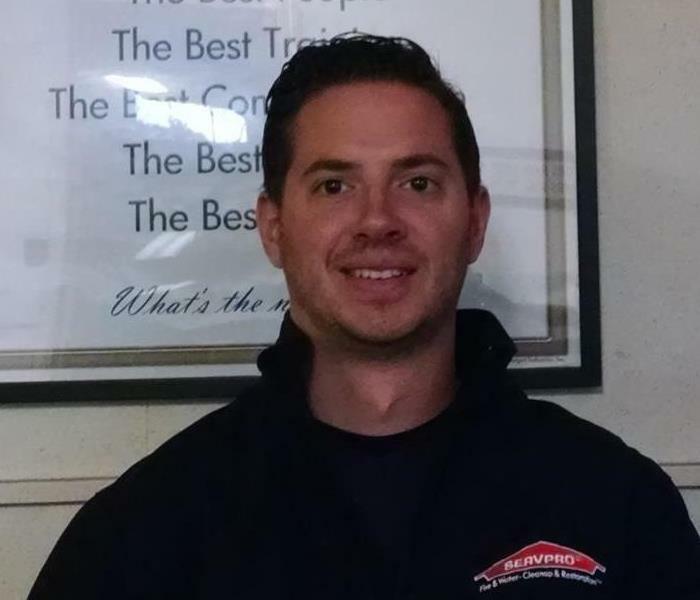 I am 15 years strong with SERVPRO of The Southtowns and I am constantly learning and striving for more! We are very team based. Everyone gets along and has fun, but when it’s time to take care of business we are all hands on deck. I would said I am fair but firm. I try to use teachable moments. We just keep growing! I am looking forward to hiring more people and being able to expand our reach to help more and more homes and businesses across Western New York. Commitment and hard work. This is not an easy job, there is manual labor, long nights, and dirty work sites, but someone who is willing and able to do what’s needed when its needed, able to change on the fly, things are always changing. Thank you for taking the time to answer our questions Chris! You are an integral part of our team. In most cases, it is actually more affordable to restore your belongings after a fire and/or water loss than to replace them. After experiencing a fire and/or water loss it is common for people to think that replacing all of their contents would be less expensive than restoring them. As a professional in the Restoration Industry we are here to tell you that is false! The technicians at SERVPRO of The Southtowns are trained to see beyond this common misconception, and restore your contents/valuable to a preloss condition. The mitigation process of cleaning yields excellent results at a cost-effective price. Mitigation stops further damage and reduces the loss, while restoration puts the damaged items back to their preloss condition. For ultimate results, mitigation needs to begin within twenty-four hours of a loss. Any delay will complicate or, may devalue the mitigation effort. In order to guarantee the removal of smoke odor, all of the contaminated areas need to be cleaned, deodorized and possibly sealed (where applicable). Also, all odor molecules, whether airborne or absorbed, need to be neutralized. 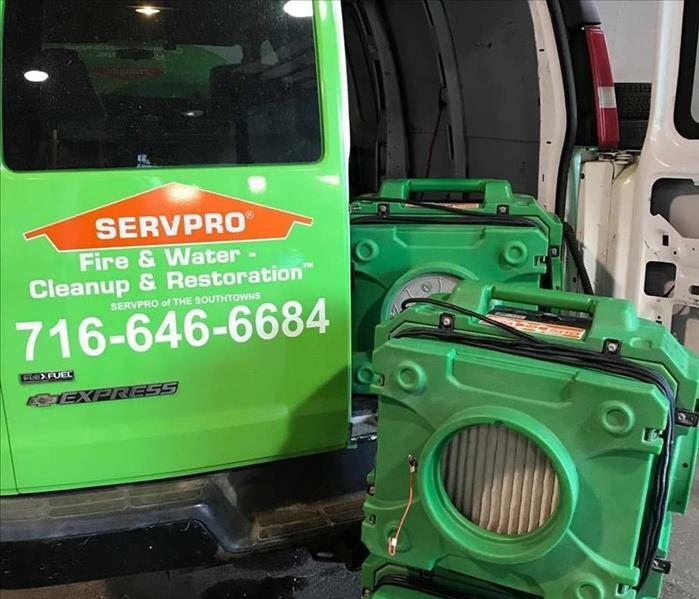 So if you experience a fire and/or water loss this spring, give the experts at SERVPRO of The Southtowns a call (716) 646-6684 to begin the restoration and mitigation process immediately! We are always, “Here to Help”. Having water damage in your home or business is stressful enough, filing an insurance claim shouldn't be. Discovering water damage in your home is stressful enough, filing an insurance claim shouldn’t be. So here our top three tips when it comes to filing an insurance claim for water damage. 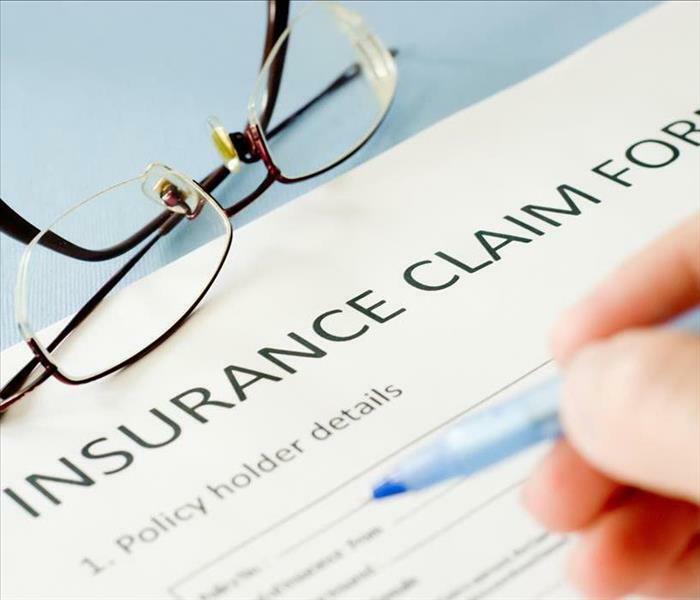 These tips and tricks come highly recommended from our top Insurance Agents, and make the claim processes faster and easier. Stay Calm and Carry On-It may sound simple, but staying calm during the claim process can make a huge difference. By keeping your emotions in check, you will be able to better communicate and describe the damage to your insurance agent, hear what they are saying with clarity and also not miss any important information they are trying to share with you. We recommend that you keep a list of phone numbers on your fridge (ex. SERVPRO of The Southtowns, your Insurance Agent, and the local Fire Department) just in case of an emergency. Remember, it’s always best to be prepared. Snap Some Photos- Taking photos of any water damage or standing water is ALWAYS a good idea. It allows the insurance company to see firsthand the extent of the damage, as well as help protect you should a question arise. These days most people carry their smart phone on them at all times, so having access to a camera is no problem! Speak Up!-Dealing with a water loss claim can feel overwhelming at times. If you ever have a question about what is going on be sure to ask. Our office staff is here to explain and answer any question you may have. ALL of our technicians are IICRC Certified, and can answer any questions you may have onsite. Here at SERVPRO of The Southtowns we understand that this may be your first water loss and we are always available to help our customers. We would like to point out that every insurance policy is different. So be sure to call your Insurance Agent prior to filing a claim, to determine if there is coverage for your water loss and policy details. If you are questioning if you currently have coverage for a water loss, give your local Insurance Agent a call and schedule a review of your policy. 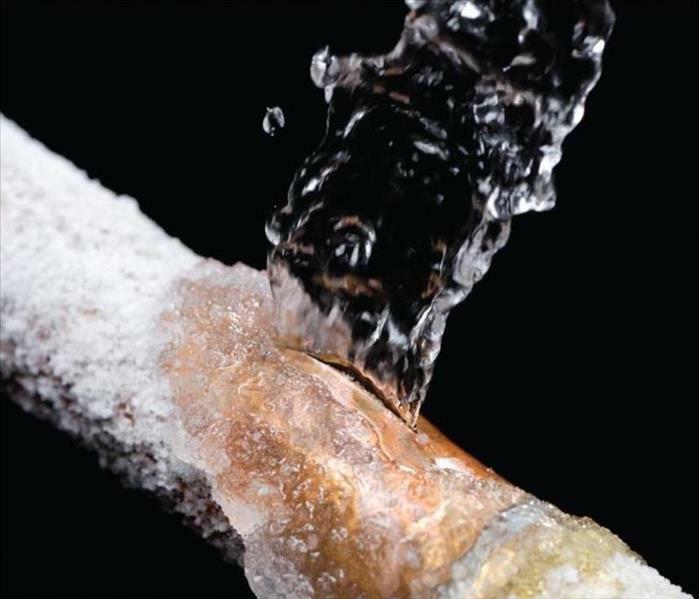 Use these preventative measures to prevent frozen pipes in your home this winter. January is here, and so is the frigid temperatures. Also, it’s the time of year Western New Yorkers like to travel to a warmer climate to escape the cold. If you are planning your winter escape, it is important to take preventative measures to prevent the pipes in your home from freezing. Water damage from a burst pipe can be devastating, and costly. Especially when the water is sitting stagnant in the home for more than 24 hours, this leaves the potential for mold. Here are a few tips to prevent the pipes in your home from freezing. Keep the furnace running at 55 degrees-Turning the heat down when you are away from the home for an extended period of time is smart, but be sure the thermostat does NOT go below 55 degrees. Insulate pipes exposed to outer walls-This gives pipes that are more prone to freezing added protection. Allow water to flow through pipes by turning on faucets to a slow drip-This keeps water moving consistently through the pipes. Open cabinets to allow heat from inside the home to help keep pipes warm-The extra air flow will help prevent the pipes from freezing. Should you come home and find that a pipe is frozen, take immediate action to thaw it. If you experience water damage from a pipe that froze and burst, call the experts at SERVPRO of The Southtowns at (716) 646-6684 to begin the mitigation process. 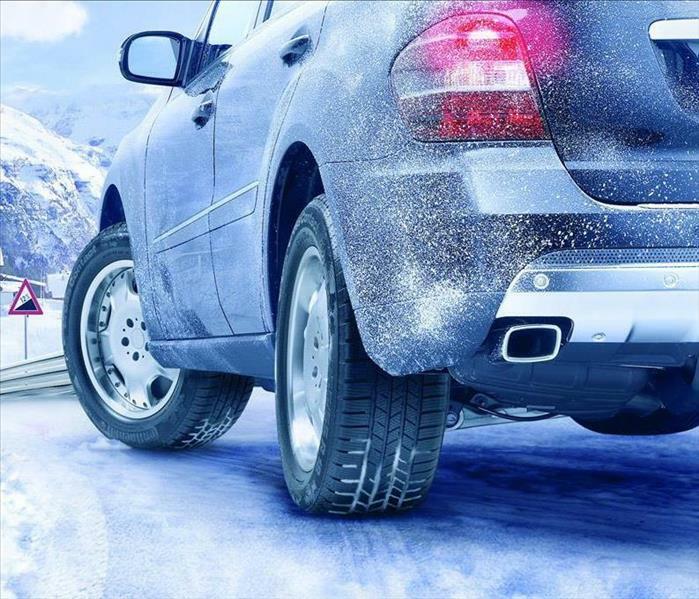 Having a Emergency Winter Kit in your vehicle will have you prepared for when disaster strikes! Although December and January have been mild so far in WNY, one thing is for sure, the snow is coming! And while we haven’t seen a lot of the white stuff yet, it is a good idea to prepare for it now. One way of doing that is to keep a Winter Emergency Kit in your car for when disaster strikes! Here are some things that you will want to keep in your kit. We recommend storing these items in a water proof bin/tot (you can get these at any store) and placing it in your vehicle’s trunk. If you already have an Emergency Car Kit just add a few additional items and you are good to go! 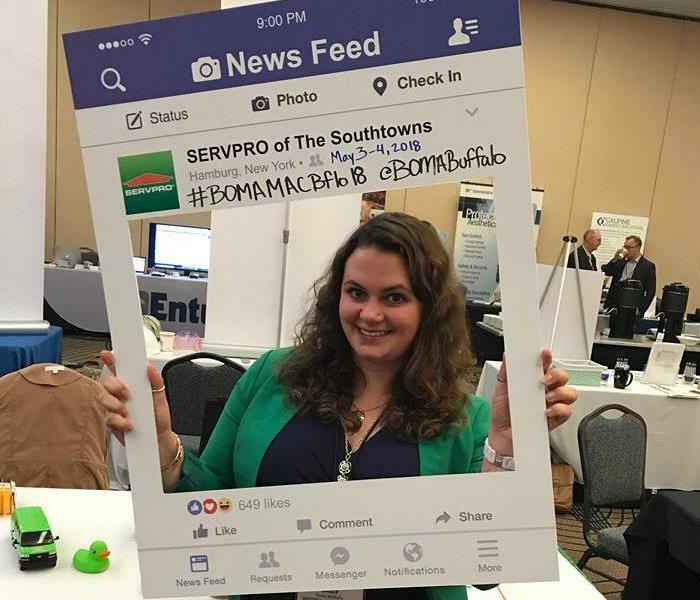 4/11/2019 - Welcome Back to the BOMA Board Emily! 4/11/2019 - Do You Need CE Credits? We Got You Covered!